Harlem, Manhattan, NY (April 8, 2019) – According to police, an NYPD officer was involved in an accident while riding a dirt bike on Sunday evening, April 7th. The accident was reported to have taken place at the intersection of Lenox Avenue and 135th Street at approximately 6:00 p.m.
Video of the incident was stated to have shown the officer riding the dirt bike through the intersection before losing control for reasons that are currently unclear. The officer narrowly avoids a collision with another vehicle before wiping out and tumbling across the roadway. The dirt bike continued along the street and ultimately struck a vehicle that was idle at the intersection. According to authorities, the officer was taking the bike to the 32nd precinct at the time of the incident, which also resulted in at least minor injuries. The officer was transported to a local hospital for treatment. At this time, the accident is under an internal investigation. Our most genuinely heartfelt sympathies are extended to the injured officer, first and foremost. We preserve our hope for his full recovery at this time. 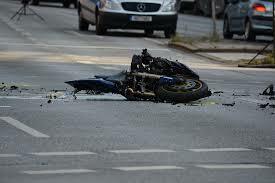 Motorcycle accidents in New York are often seriously injurious or deadly since there is little protection in place for the rider at the time of impact. While it can be very challenging, it is imperative for victims to understand that they may have substantial rights moving forward, particularly when an accident may be considered a work-related injury. Our New York accident attorneys at Hach & Rose have dedicated their lives to helping those who have suffered due to the actions of another party or entity such as an employer. We realize that there is nearly nothing as difficult as dealing with an unexpected injury and we are here for you 24/7 to answer any questions you may have. If you have suffered injuries in a motorcycle crash or any other accident due to the actions of a negligent party or other entity, please call 212-779-0057 and let us put our experience to work for you today.